Fred is a city fox, but the city can be a scary place. It’s noisy, it’s smoky, and it’s often dangerous. One day, Fred sees a flock of birds flying over the rooftops. Where do they go? he wonders. When a bird tells him about the place called the wild, he decides to go in search of it. Will he find the wild? And what will happen if he does? Clive McFarland grew up in Northern Ireland before taking a ship to England to study art and design. He works with paint, crayons, and cut paper to create his textured illustrations and brings everything together digitally. A fox named Fred quests for a life away from his native city...In a nice twist, the ending defies the familiar "no place like home" trope. There's lots that appeals: a polite but determined fox, just enough danger, and plenty of colorful art. In this charming British import...Fred’s adventure gently encourages children to imagine and be curious about the wider world around them in this readaloud suited to classrooms and bedtime alike. 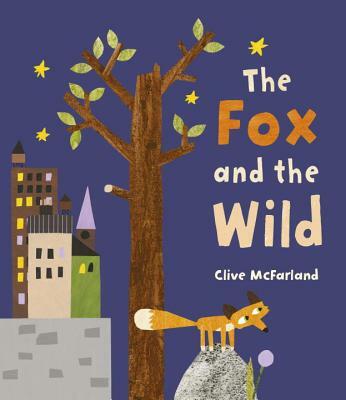 With collage-style cutout illustrations varying from full page to multiple scenes on one, McFarland tells a tale reminiscent of the classic “Country Mouse, City Mouse” story...The illustrations and the fun text design make this a great read-aloud story to be enjoyed by a broad audience. A strong addition to any picture book collection. This simple story shows the power of inquiry. Bold illustrations use crayon, acrylic, and watercolor to depict both city and countryside scenes. The story flows quickly and ends with a chance for open-ended discussion.